The Alliance High School Foundation began in 1948 as the Alliance Education Foundation, but there was little activity until 1987 when it was reorganized under a committee led by John Klusch ’34 as chairman and included Sarah Morris Brown ’61 who is the current chairman. The newsletter was initiated that year reaching out to alumni for contributions and the first scholarship was awarded to Diana Fails. This scholarship, the Foundation’s oldest, was briefly discontinued in 1991 when the Foundation’s leaders decided to recognize academic excellence in the form of monetary awards to each member of the top 10 percent of the graduating class. Those awards continue to this day. 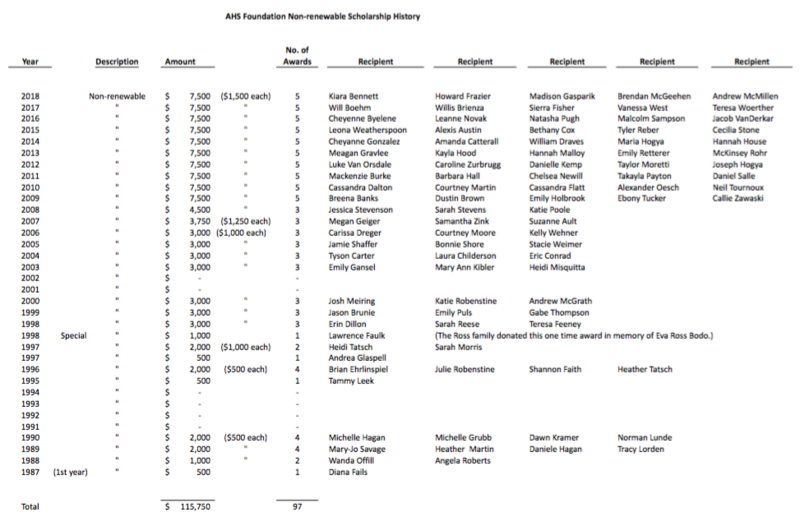 In 1995, the Foundation had raised enough funds to restart the individual scholarships in larger amounts.